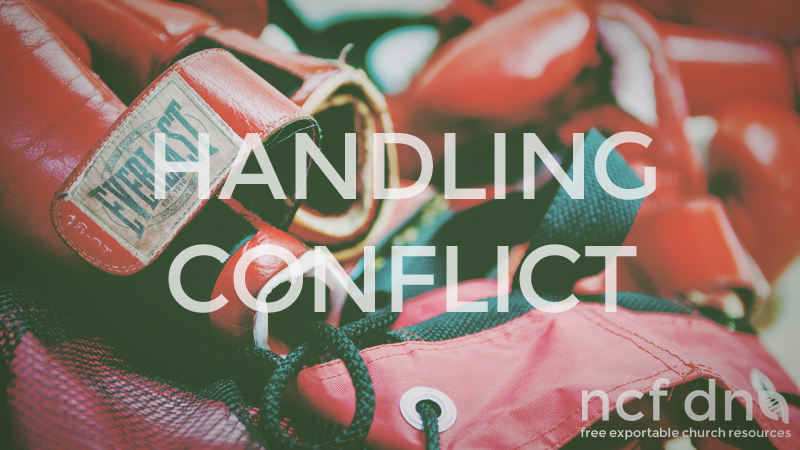 An ability to handle conflict is a critical skill for any leader. Marriages sink or swim on this ability. Churches split and friends tear apart when the ability is undeveloped. There is no way that you will lead on an eldership team for any significant period without some co-elder letting you down or irritating you. Even if your team comprises amazing people, the Devil will ensure that you see your co-elders frailty. We need to remember that, like us, our co-elders are frail. If God lifts his blessing under strife and commands his blessing under unity, what is unity? It’s not uniformity, it’s not conformity, it’s not silence under duress, it’s not spineless compliance, it’s not ignoring sin and it’s not ignoring situations. Unity is covenantal in nature. Unity is made possible because of the work of Jesus (Eph 2 v 11 – 22). It is an expression of unconditional acceptance despite differences in style, opinion and conviction. It is an expression of honour of personhood which is not subservient to performance or reciprocal love. In that sense honour and unity can be offered unilaterally, and love always triumphs in the end. Honour: A young man wrote me a letter the other day, observing the marks of our church culture (he had recently joined the staff). He said I notice 3 things that define our culture: mission, relationship and honour. It was the last value that got my attention, HONOUR. Honour your mother and father and it will go well with you (ex 20). It is the first commandment with a promise. Honour brings blessing. Honour does not mean you cover over sin, but it does mean you compensate for weakness, it means you treat the dishonourable with special honour, it means you don’t draw attention and ridicule the weak. If sin is the cause or the strife, we are encouraged to rebuke older men gently (1 Tim 5v1) and those caught in sin in a manner that will be redemptive. Humour can be dishonouring. Leaving peers stranded, without support is dishonouring. Speaking badly of a peer is dishonouring, even if it’s to your spouse on your pillow at night. Humility: a humble man is able to say sorry, to admit he is wrong, to concede on small matters, to take the initiative when relations are strained. Elders ought to be able to bring peace into conflict let’s see Paul in action writing to the Philippians 4 v 1-8. V1 Therefore, my brothers, whom I love and long for, my joy and crown, stand firm thus in the Lord, my beloved. He is able to say he loves them and expresses his affection. V2 I entreat Euodia and I entreat Syntyche to agree in the Lord. Paul pleads, but notice that he is not siding with any lady, but siding with peace. Paul does not pretend the differences are not there, he deals with them. V3 Yes, I ask you also, true companion, help these women, who have laboured side by side with me in the gospel together with Clement and the rest of my fellow workers, whose names are in the book of life. He asks a fellow leader to intervene in the resolution, this is in keeping with Matt 18, since this dispute has clearly become a public matter. Elders are called to be peace makers. We do this by bringing the prince of peace into troubled situations. V4 Rejoice in the Lord always; again I will say, Rejoice. It’s a good thing to remind believers that they are arguing before the throne of Jesus. V6 do not be anxious about anything, but in everything by prayer and supplication with thanksgiving let your requests be made known to God. V7 And the peace of God, which surpasses all understanding, will guard your hearts and your minds in Christ Jesus. V8 Finally, brothers, whatever is true, whatever is honourable, whatever is just, whatever is pure, whatever is lovely, whatever is commendable, if there is any excellence, if there is anything worthy of praise, think about these things. But the overriding key is that you be at peace with God. If you bring the prince of peace into troubled waters they will be stilled. We have friendships on team with absolute freedom with others of the same gender. However friendship across the gender line are in the context of two couples as friends. If offence across the gender line takes place, the husbands should meet and lead the reconciliation. No private fights or meetings should be taking place across the gender line. We recognise the husband’s role to protect his family and govern in such a way as to bring peace. If an accusation is being brought, it should be one so in front of witnesses. We don’t “close rank” when sin is bandied about, we deal with it, but we don’t tolerate gossip. We hope that this resource blesses you and the way you handle conflict in your leadership teams. Feel free to print, edit and distribute this document.